Craters of the Moon is about halfway between the Grand Tetons and Boise. It’s volcanic, like Yellowstone, but it’s very recent, with its eruptions coming several times only 2,000 to 15,000 years ago. 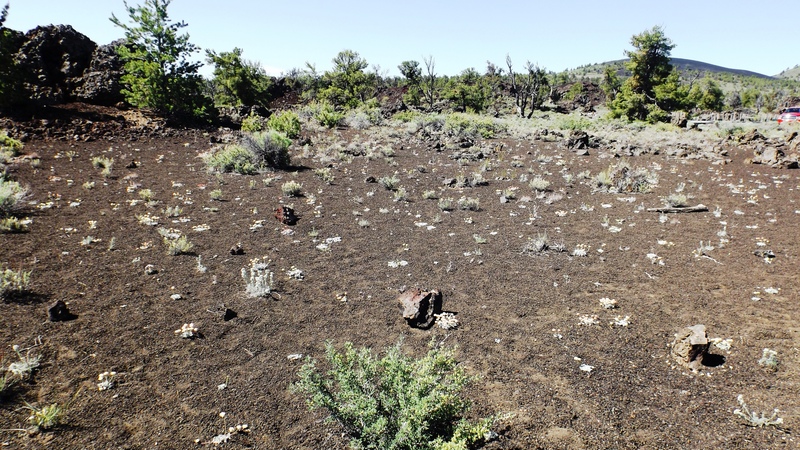 Craters is fresh and gritty with nothing but lava soil and little rain; plants have a tough time making a living. The Park Service says wildlife “abounds” but we saw nothing larger than red-tailed hawks. 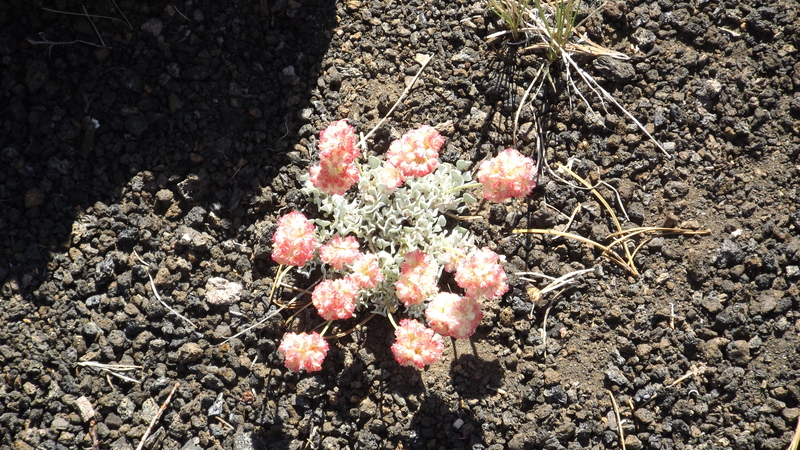 In the lava fields, as in the hundred miles of sagebrush scrub surrounding Craters, you notice space between every plant, as if rangers had planted them. But they didn’t. There is space between them because the soil can’t hold rain, and the plants have adapted with huge root systems to take advantage of any moisture that falls. 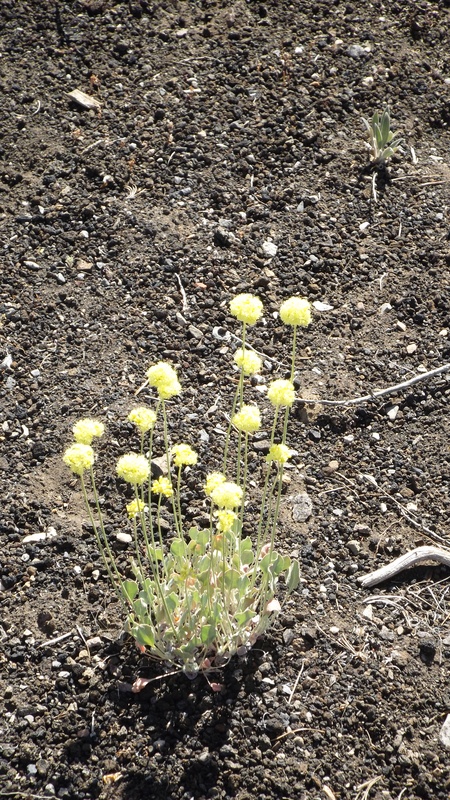 Put the plants closer together and there is insufficient moisture for survival. 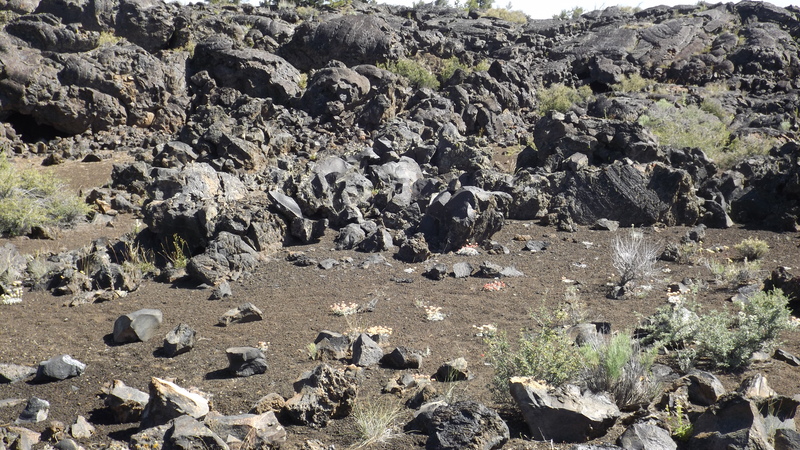 Competition for water has spaced plant life on the lava. 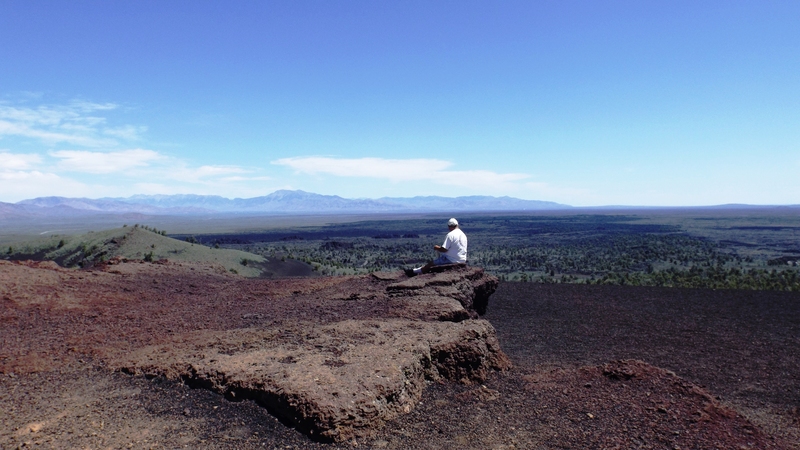 We climbed the Inferno Cone to see what we could see from the top. There is no road up. They let you hike on the slippery cinders. It is only a quarter of a mile each way, and maybe 500 feet of elevation difference between start and summit. But “only” is something those who don’t walk it say. Those who do walk it say other things. I chose an old Sioux battlecry as my last words before the ascent: “Today is a good day to die!” The descent is easier on the lungs, but harder on the toes and knees that do the hard, scary work of braking. The view from the top is fine, but it’s better from that bench just below the summit. The Park Service killed these trees; that’s now considered a mistake. 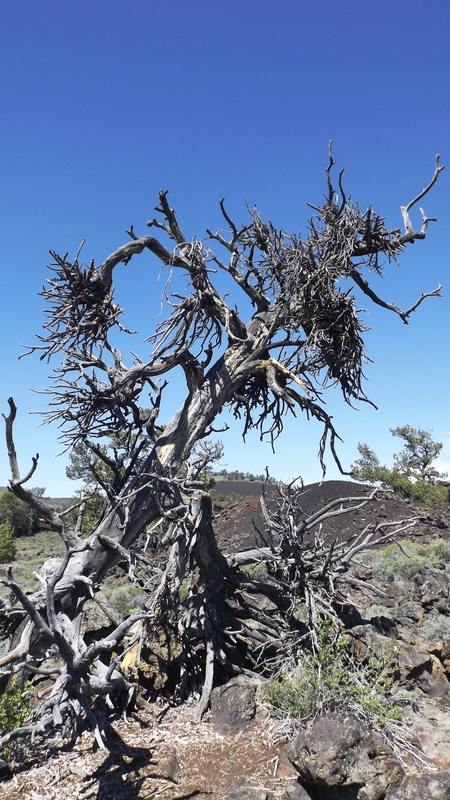 Those old limber pines were afflicted with dwarf mistletoe, a parasite that tricks the host tree into sending extra nutrients its way. Those extra tree calories feed the mistletoe, and make the pines grow clusters of branches nearby. Over time these clusters become Witches’ Brooms, once considered unnatural. These have been dead over fifty years. 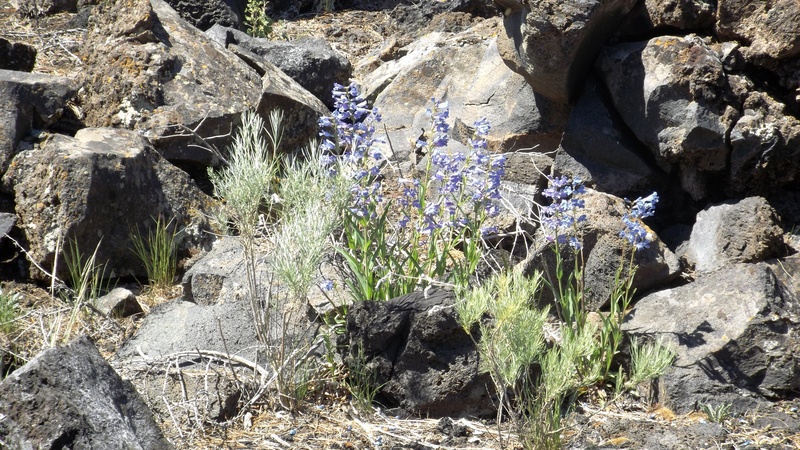 Decay comes slow in a dry climate. 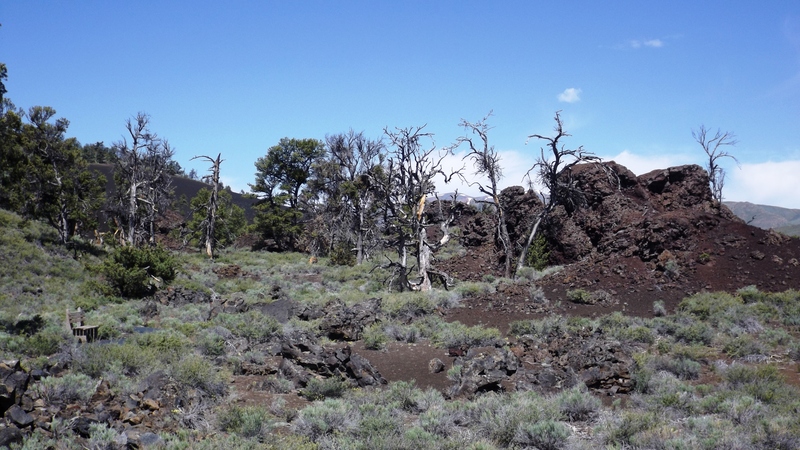 Craters is a strange landscape with a fine campground (Lava Flow). Spend a day here if you get a chance.